kiLaroLi – AzhwAr enjoys thirumalai (divine hill of thirumAlirunchOlai, a beautiful dhivya dhESam located near madhurai) where emperumAn who mercifully united with him is mercifully standing. 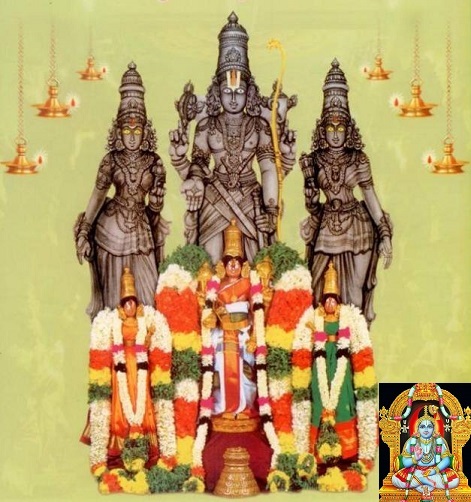 In tenth decad – emperumAn mercifully agrees to bestow the purushArtham (goal) that was prayed by AzhwAr in emmA vIdu (previous decad); AzhwAr prays to emperumAn that he bestowed that result while he is in his current body itself. emperumAn seeing AzhwAr’s great desire, shows thirumalai (thirumAlirunchOlai) to accept his service there; seeing that, AzhwAr becomes greatly pleased and says “Do I even need to serve you? this divine abode of thirumalai is my ultimate goal”. Explaining these, AzhwAr establishes that thirumAlirunchOlai which is dear to such emperumAn is the ultimate goal and instructs his enjoyable nature to his own heart in the first five pAsurams and to other worldly people in the next five pAsurams. thirumAlai ANdAn said that ALavandhAr mercifully explained this decad as “AzhwAr approaching thirumalai (thirumAlirunchOIai) to achieve the goal that was established in the previous decad of ‘emmA vIdu‘”. But emperumAnAr says, it is not like that and explains it further. emperumAn observed in the previous decad that AzhwAr highlighted in each pAsuram his urgency to attain the goal by saying “ollai” (immediately), “kAlak kazhivu seyyEl” (don’t delay) etc; he thinks “AzhwAr already informed his desire to me and I have also already agreed to fulfil his desire saying ‘it will be fulfilled at the end of this body for you’, looking at his urgency, he seems to want to have this goal fulfilled while being in this body itself; so, let me find a nice abode where he can serve me” and went through different places and made his presence in thirumalai thinking “this looks like a nice and secluded place”; he then said to AzhwAr “I have arrived here and am standing here to be friendly with you; you can come here and enjoy with me to your full satisfaction” and manifested his presence in south thirumalai to AzhwAr. AzhwAr too, meditated upon that and thought “if bhagavAn is the goal, the abode he resides is also equally enjoyable” and thus enjoyed the thirumalai, its surroundings, his own full desire to enjoy thirumalai – all as part of the goal and becomes blissful. This entry was posted in thiruvAimozhi, thiruvAimozhi 2nd centum on June 21, 2016 by Sarathy Thothathri.